Distinguishing Characteristics Native American female. Black hair, brown eyes. 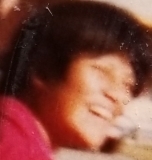 Elgo was last seen in Peridot, Arizona sometime in 1983. She has never been heard from again. At the time of her disappearance, she was known to travel between Mesa and Phoenix, Arizona. Few details are available in her case. Updated 3 times since October 12, 2004. Last updated April 10, 2019; age-progression added.